Running lately has been as fun as I’d hoped. Back to routine, back to progress. I enjoy running more when I’m working toward a goal and a new training cycle is definitely making me excited about what’s to come. My body is slowly getting used to 5 runs per week again and I’m all too happy to climb into bed at night. After three weeks of a new training cycle, I’m happy to see that I really haven’t lost any speed since Boston (which is surprising considering the sloth-like state I assumed for 5+ weeks!). This past weekend I went home to see my family for the first time since Christmas (other than seeing them in Boston). I was looking forward to the trip for weeks, especially because we have a new addition to the family and I’m an aunt to THREE crazy boys now. Unfortunately, the trip didn’t go as planned and after car trouble on Friday night, I was really upset and disappointed that our Friday night plans with my family were botched and we had to return to Chi to deal with the car. Luckily, Megabus had available seats on an outgoing bus the next morning and a decent return time on Sunday afternoon. Friday was a long and exhausting night but I forgot about all of that when we arrived at my mom’s house and the entire family came over to enjoy an afternoon hanging out at the house and in the back yard. It’s times like these when I really miss the peaceful quiet of my mom’s backyard. I sat on the deck in a comfortable chair with a beer in my hand and closed my eyes while the sun shined down. (If I stopped to imagine it, I felt like I was back in Cabo minus the sun pool.) That feeling has me longing for an apartment with a small patch of “green” in the concret jungle of Chicago. Because of the travel difficulty on Friday night, I wasn’t able to run my normal long run on Saturday morning. I switched it to Sunday morning. After dragging myself out of bed, I laced up and went out around my hometown. Since I was in high school, the park district has added plenty of paths and trails that basically go all the way around the town. I’m nostalgic about the older paths because I ran them when I was younger, during cross country in middle school and high school. It’s funny how they never seem to change, but I’m glad they never do. I usually run out-and-back on a lakefront route in Chicago but I felt like I was ‘exploring’ more during Sunday’s run. In a matter of 90 minutes, I ran through practically the entire town. And I got some nice hill training in too because, unlike Chicago, the town actually has hills! These pictures are dedicated to all the urban runners out there. This is what “nature” looks like, people! 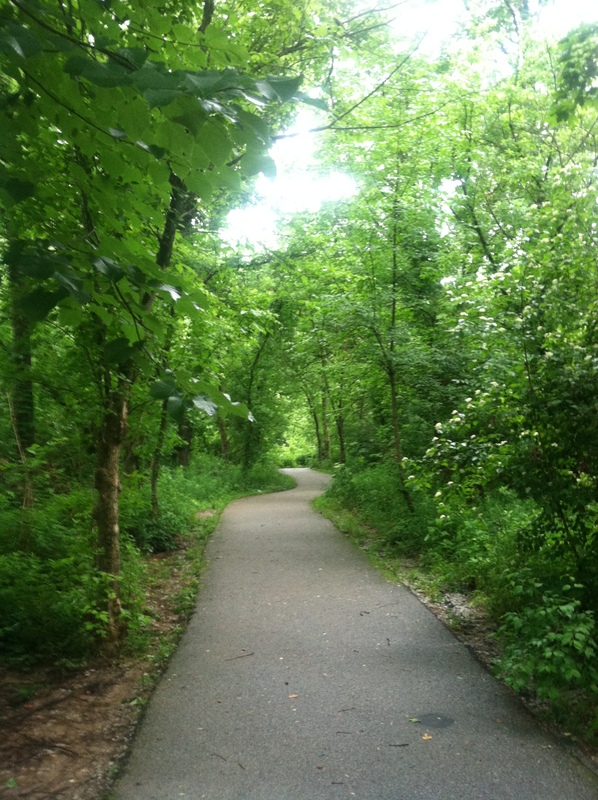 If you run in the city, when was the last time you ran on a wooded path? Do you make an effort to find paths or trails like this every once in awhile? Do you prefer city or suburban running? You clearly found middle earth! 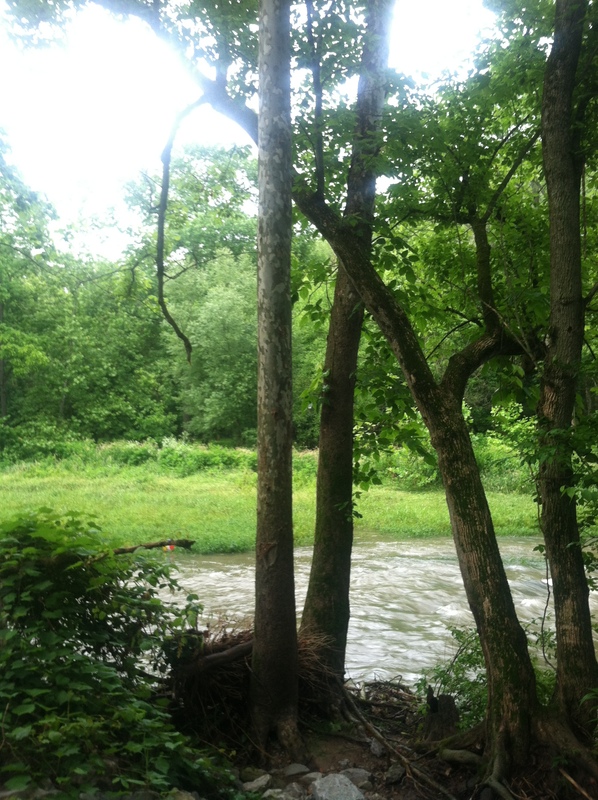 Last time I ran in a woody area was on a business trip out to Fredericksburg in Spring and they had some nice path that went through woods, a river, some hills and so on! It was very nice! first time doing it I was a little nervous I went the wrong way and wouldn’t find my way back to the hotel! Outside of that, I haven’t ventured away from the lakefront path. Since I’ve moved to Chicago, I have lived within a couple minutes walking from it. Venturing off just means going off to the gravel path closer to the lake up north hah! I try to get out to the trails every other weekend. It’s great training (hills and footing), and also really rejuvenates my mind/psyche. When I visit my hometown, which is out in the country, I often struggle with finding good running routes and usually end up on my high school track! I try to do trail runs at least 3 or 4 times a week. 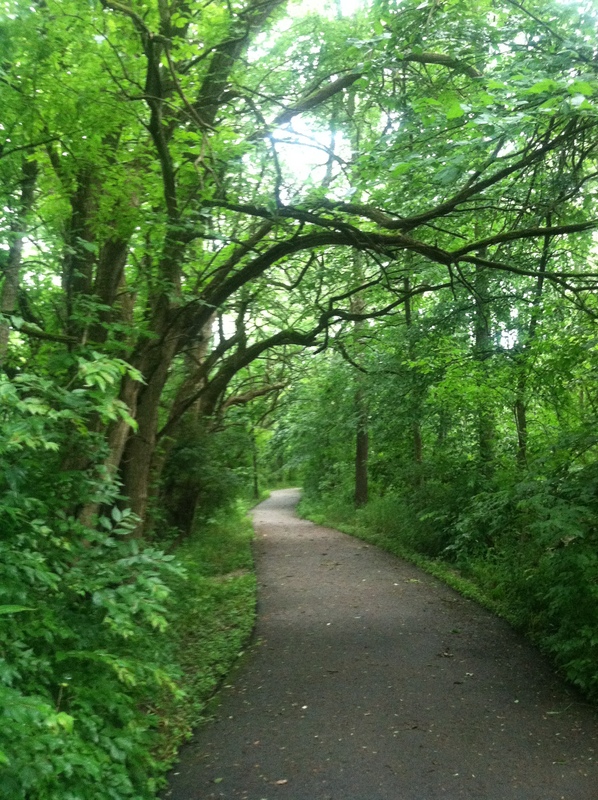 I’m in a suburb right outside Chicago but we do have the trail along the Des Plaines river. That is enough to scratch my itch for trail running. I wish I could teleport you and the rest of #TRWU to the trails here in Virginia Beach. Beach views and gorgeous trees! I have to admit though that the very few times I have run in Chicago it was pretty amazing. It sounds like running lately is still as awesome as it ever was for you during Boston! That stinks about the car trouble but glad to hear you were able to get back to your hometown! What beautiful running paths.City running totally freaks my beans.. I need like a guide if I do any of that. Obviously most of my running is on the trails currently.. but suburban running isn’t too bad depending on where you are!